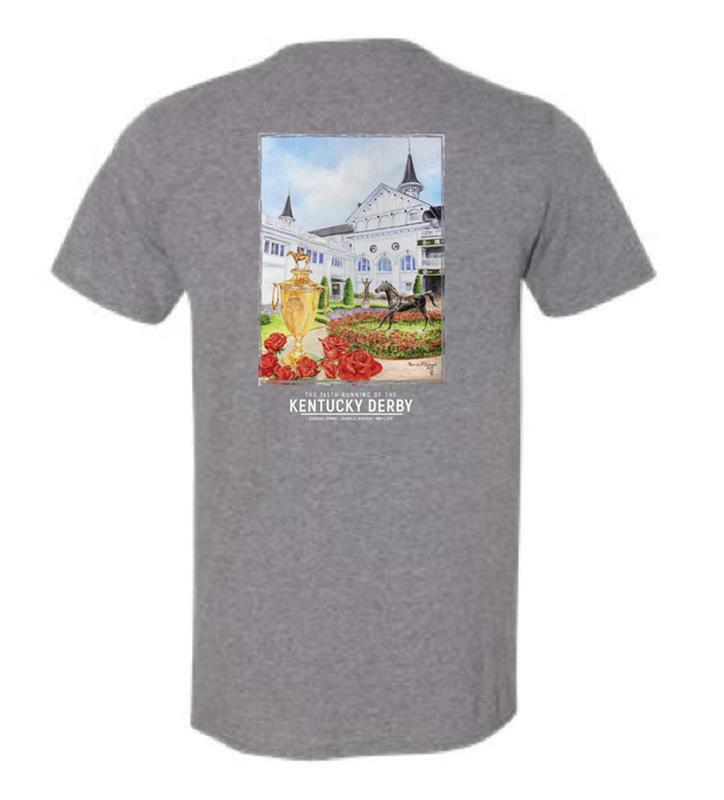 100% cotton unisex tee features the 2019 Art of the Kentucky Derby by artist Rhonda McEnroe on the back and the official Kentucky Derby 145 logo on the chest. Available in unisex sizes S-XXL in navy and graphite. Rhonda McEnroe's professional career began in 1979 with a successful line of limited edition prints which established her as a skilled watercolorist. Through the appreciation of thousands of print collectors her talent expanded from the print market to fine art originals for private and corporate collectors such as Forbes Magazine, New York, NY, Humana Hospital, Louisville, KY and Stryker Corporation, Kalamazoo, MI. Prolific is a word used to describe Rhonda's paintings because she refuses to be labeled with only one classification of techniques, or only one medium. Her techniques range from realistic watercolors, impressionistic pastels and acrylics, along with oils and mixed media for her abstract and large custom-designed canvases.